These metal art memorials are what the Legion is raising funds for with their Trivia Challenge. Donna Lafleur from the Moosomin Legion spoke to Moosomin Chamber of Commerce members at their meeting Wednesday about the Legion’s Trivia Challenge fundraiser that is coming up on Saturday, March 30. Lafleur said the fun event would be a fundraiser for the Legion’s metal art memorial project. 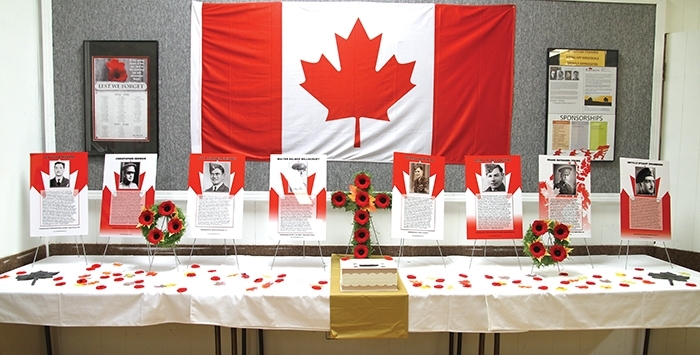 The Legion is currently having metal art memorials made for all 85 soldiers on Moosomin’s Cenotaph. The plaques will be hung in the Legion hall when completed. “For the past 10 years the Canadian Fallen Heroes foundation has been trying to raise money to do these,” sys Lafleur. “They’ve partnered with local organizations, and as a Legion branch we’ve partnered with them. “Our hope is to display all 85 prints. Most communities have fallen heroes of 20-25 people. Moosomin has 85 names on the Cenotaph. Lafleur said there were various levels of sponsorship for the memorials and listed some of the local businesses that had sponsored to date. “So far we’ve had Bronze ($250) sponsors from Prairie Livestock, Don’s Towing, Hutch Ambulance, Rotave Sanitation, Tagweed Enterprises, Sew Creative, Bradleys, and then five personal donations,” she said. “Silver ($500) has been Borderland Co-op. Gold ($1,000) has been the Town of Moosomin and RBC. She added that there are also platinum sponsorships available for $2,500. Lafleur told chamber members that the trivia contest will be something fun and different for the Legion to do as a fundraiser. “We’d already done a couple of suppers and soup and sandwiches, but on March 30, we thought we’d do something different,” she said. “Conexus actually had this trivia for their Christmas party, so we thought why don’t we give it try. So we’re trying to do a fundraiser. “We do have a deadline of March 15 for entries, and on behalf of the Legion we’d just like to thank anyone who can support us, and if anybody knows of somebody who has a name on the cenotaph and they maybe have a picture or want to write a story, it won’t cost us the full $250 if we do part of the work. Lafleur also explained how the Trivia Challenge works. She said teams of four to six people compete, and there can be a maximum of 18 teams entered. Each team will have a buzzer at their table, and when the trivia question comes up, they can choose between four answers. “This is going to be a heck of a fun night,” she said. “It’s not hard, you don’t have to be overly smart, you can take a guess and you have a 25 per cent chance of being right. “Everything is automatic. Every team will have their own buzzer at their table. And you hit A, B, C or D, and it tallies everything automatically. The prize for the winning team is a $250 gift card from Red Barn. She said there will also be a guaranteed 50/50 that night. She said questions can range from anything, from geography to sports.